Gain the real impact by using matching Laid envelopes. These envelopes perfectly match and compliment the papers available within the Laid range. To add coherence, the envelopes come in the same finishes as the A4 papers. 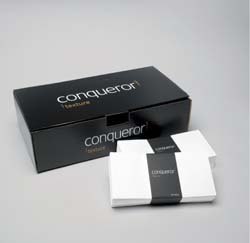 The envelopes use a peel and seal system to allow ease of use and simplicity. Great for personal or professional correspondence, particularly mailing of letters, business documents, press releases and any other communications where quality and creating the right impression are important.